Toys R Us closed last week. On Thursday March 22nd, 2018 the company closed all of its stores in the US, Canada and the UK. The stores you see now are zombies, taken over by liquidation companies that will whittle away at the price of their stock until every last toy, shelf and light bulb are gone. This includes the store that was near my house. I was four years old when that store opened. My childhood memories are extremely hazy in general, but I do have recollections of the event. My parents took me to the celebration and there were giveaways and games, and a big parade around the store led by Geoffrey the Giraffe and his family. Back then the mascot looked like a cartoon instead of a live animal, and had a wife and three kids. For years the cartoon versions were painted in a mural over the customer service desk. My mom took a picture with me and the person dressed as Geoffrey, and the photo is still in my mom’s album. As I got older I continued to go to that store. I remember as the video game section became the R-Zone, and as the games in the glass cabinets transformed from SNES cartridges to Switch cards. There were always at least four kiosks to demo the latest games, and if you wanted to buy a game you had to take a little sheet of yellow paper to the counter where they’d give you an actual copy. I remember playing a lot of Pokemon Stadium there until I got my own N64 as a Christmas present. Lego sets transformed from themed sets and freestyle to licensed designs like Batman. The aisle used to be tiny, and over the years it got bigger and bigger until it got its own section. Barbie on the other hand got smaller and smaller. My mom and I would gasp and coo at the Collector Barbies locked in the glass showcase, visions of sequins and embroidery next to doctors and lifeguards. Up until this death gasp, the Barbie section didn’t even take an entire lap around an aisle. When Pokemon first came out about half the toys were in the ‘girls’ section and half in the ‘boys’ section, and as the gens progressed more and more of the toys went to the boys’ aisle, which I quit frankly never understood. How did Pikachu and Eevee more belong next to Understaker figures instead of My Little Pony? VHS tapes became DVDs, DVDs became BluRays. During Gen III of Pokemon they were giving away the legendary Pokemon Mew for FireRed and LeafGreen. I waited hours in line to get the Pokemon, never had been able to get it on the original games (oh, and how many hours did I waste online chasing down codes and glitches that didn’t actually work. Stupid truck.) It was the first time that I had a chance to meet like-minded Pokemon fans until I was in college, the games having gone out of fashion in my high school. The DS’s Wifi made the process simpler and easier, but honestly, I liked that it was a big event and the anticipation of waiting. I remember longing for the Sailor Moon dolls made by Irwin and the Cardcaptors toys made by Trendmasters. To this day I still kick myself for not asking for a sealing wand when the store had them on clearance. I was too shy and we had too many financial problems to even ask for the toy on sale. Today those same wands sell for upwards of $600. I went to the store during elementary school, middle school, high school, college and until they announced the store would be closing. The last toy I got before the liquidators got their hands on the stock was a Pokemon Z-Ring for $8—I wasn’t about to make the same mistake twice. I remember every single time the store remodeled, first when they switched from straight aisles to little sections, when the electronics section got downsized to install a Babies R Us. I was very sad when the mural of Geoffrey’s family got painted over, but the mascot got updated to a real giraffe that could talk, and the R-Zone and the customer service desk got blended together. I lined up for events for free Legos, Pokemon and Yugi-Oh cards, the fact that I was an adult never bothered me. The Toys R US catalog was one of the highlights of the Christmas season, a virtual who’s who of the best toys and figuring out what I’d like to get. So like Blockbuster, Circuit City and arcade cabinets in every grocery store and mall, Toys R Us now becomes a part of history, a point of nostalgia millennials such as myself can get misty over. The industry will continue to change and warp, either adapting to changing tastes or dying out entirely, as is the circle of life and business. 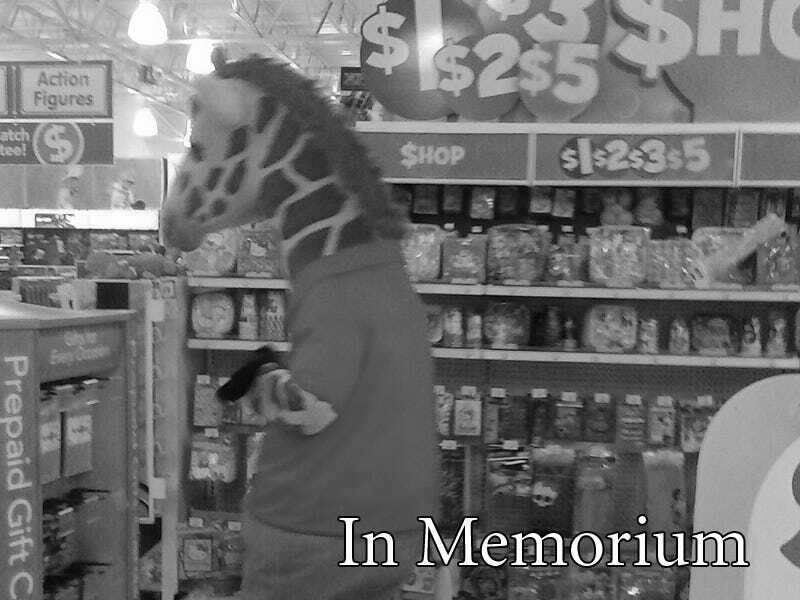 But I will never forget that for much of my life I was a Toys R Us Kid, and even if it was just a corporation, I grieve its demise.